I bought this lens as a cheap foray into the world of Nikon once again. The lens is a exercise in mediocrity. It's not a bad lens but it's not a great lens. It is priced in the middle for a middle series lens. It's not cheaply built, on par with the gold ring lenses. Optically it is capable of producing some outstanding results but it really makes you work for it. If you want a sharp picture you have to use manual focus. I found that using the VR would result in even further loss of sharpness. Now I really should qualify my definition of sharpness. I'm a photography professional so I tend to look at things like this through a microscope. The person who is going to use this lens on average will be quite pleased with the results. Compared to other 70-300's it's a little on the heavy side but that is not necessarily a bad thing as it helps with holding the lens steady. When compared to other 70-300 lenses it's actually quite superior, definitely near the top of the heap of consumer lenses and worth every penny of the $529.00 I paid for it. I'm pleasantly surprised by this lens, the sharpness blows away my other zooms, even wide open at 300mm. I have another version of a 70-300 zoom the Nikon AF G version and could never got good image quality with that lens. I was almost ready to spend 3 to 4 times more on a fixed 300mm lens when I came across this lens, saw some images here in PR gallery and decided to purchase a refurbished unit. About the VR function in the 70-300, I find it superior to the VR in the 18-20 zoom, it works wonderful, I have used low shutter speeds at 300mm and gotten sharp images, it is slightly more noisy than the VR in the 18-200 zoom but does a superb job. AFS is fast when using single spot AF, used to catch some birds in flight and it is hard to decide which image is not a keeper. Using area focus in dark areas can paralyze the AF and it will need some manual help to get closer to where you want to focus. I could see zero color aberration at 300 mm even on high contrast areas. This is while used on a D300 which corrects CA in case there is some, it is not the case of the 70-300 AF G version where I could see CA even in the D300. I give it 4 stars due only to the 5.6 max aperture at 300mm, I'm almost sure someone trying to shoot sports will have problems with the lens being to slow. Great lens for outdoor work with good light, especially if you are shooting from a vehicle with running engine. Upto 200 mm, the results are great, comparable to 70-200 VR (not the VR II), and this is half the weight of 70-200 VR. close focus of 1.5m is from film-plane, so the actual physical distance comes to some 1m. that is really close. There is a front heaviness in this lens that robs the overall balance a bit. No tripod mount means tripod-mounted setup is cumbersome and slow to manouevre. In bad light, this lens delivers only if you have a good AF module (CAM 2000 or 3500). At 300mm, it is soft, and needs stopping down to f8. That robs the bokeh and ruins the background. 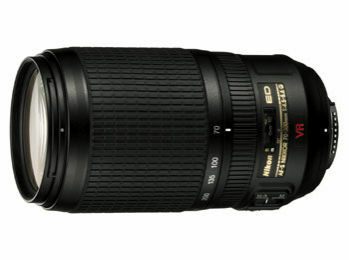 I have been using this lens, the 70-300 VR, for some two years now. the beginning was weird as it was my first VR and the effectiveness of VR was unbelievable. The point is, i have shot handheld shots at 1/10 sec and made 10" by 12" prints and there is no softness, no blur, time and again. color, sharpness, edge definition, everything is phenomenal, BUT only upto midway between 200 and 300 mm marks. Focus is almost silent, very fast, sure even with the CAM 900 focus module. The active VR is quite good, but the effectiveness of panning has not been tested. The hood is essential to avoid flare. Do not bother about filters. Only UV and polarizer are required, and polarizer is rarely needed in nature shots. 67mm may be odd but not astronomically expensive, but think of the weight reduction and soon this lens will be in your trekking kit.